This is no ordinary college classroom. The posted guidelines ask students to remove their shoes, turn off their mobile devices, and place all belongings into cubbyholes. There are no desks or chairs. No computers or projector screens. The space is like no other on campus—tranquil and centering. 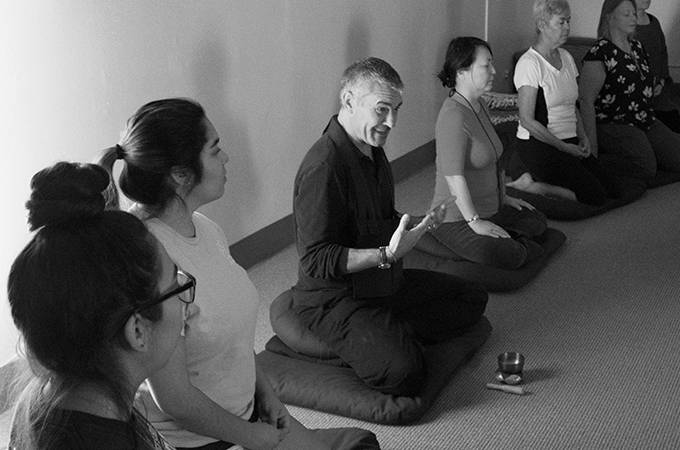 The mission of the Meditation Room program, “changing the world from the inside-out,” is carried out in a pioneering curriculum that gives students hands-on learning across a range of inner arts and sciences, such as yoga, meditation, and compassion. No matter their major—business, psychology, pre-med, education, environmental studies, creative arts—students say classes help them to be better learners, overall. Why are these kinds of classes important? Because there is a direct link between the inner world and the outer world. The courses are not easy, however! Self-knowledge, as in the dictum “Know thyself” and often viewed as a foundation of liberal arts education, challenges students in unique ways. If they stick it out, students report a wide range of benefits, including skills that are important in every area of life: attention, self-awareness, emotional self-regulation, reduction of text anxiety and public speaking anxiety, compassion for self and others, appreciation of diversity, relational healing, and creative expression. Even improvement of physical health can be a byproduct. And some students report transformations that set them on a whole new course in life. Thousands of students have now passed across the threshold of the Meditation Room and into the world. They carry with them an inner education that few college graduates have ever had the opportunity to encounter. As highlighted in a recent blog, the Redlands community also benefits from the Meditation Room, which offers a range of classes in the meditative arts that are free and open to the public. We will hold an event on Wednesday, February 21, from 4–6 p.m. in Larsen Hall so we can come together to celebrate the more than 10 years since the founding of the Meditation Room in 2007. The public reception will include a video and photo gallery, research highlights, and personal stories from participants. Please join us!